We’d love your help. 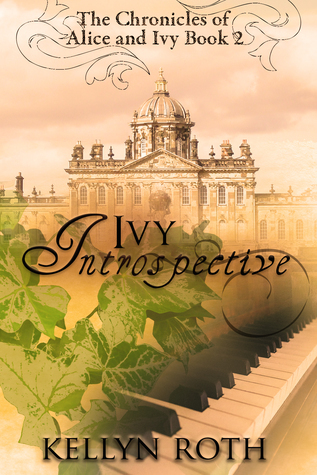 Let us know what’s wrong with this preview of Ivy Introspective by Kellyn Roth. Trapped in a world where she doesn't belong, twelve-year-old Ivy struggles to keep her head above water as her simplicity is brought to light by her new position as a young lady growing up at Pearlbelle Park. After much thought, Ivy's parents decide to send her to McCale House, a boarding school in Scotland for girls and boys like her. However, scared and worried away from Trapped in a world where she doesn't belong, twelve-year-old Ivy struggles to keep her head above water as her simplicity is brought to light by her new position as a young lady growing up at Pearlbelle Park. After much thought, Ivy's parents decide to send her to McCale House, a boarding school in Scotland for girls and boys like her. However, scared and worried away from her beloved mother, sister, and nurse, Ivy can't seem to focus. To ask other readers questions about Ivy Introspective, please sign up. Do you need to read the first book to understand this one? Also, will it ever be a physical book or just an ebook? A. Lei Simpson I agree that IvIn can stand alone and be fine. Though there are a few things that are clearer when you read TDS. The second book in The Chronicles of Alice and Ivy follows the story of Ivy Knight, Alice's younger sister. This Christian Historical novel can be read as a standalone. Recommended for ages 12-18. I'd never intended to write about Ivy, so this was an interesting book to write! I actually had to come up with something for once instead of just remembering what I was going to do with this character. :P You can read more about it on my website. This book was such a delightful tale with endearing characters and lovely writing. I can't wait to review it further upon publication! A precious story I couldn't put down! This book carried the plot from the first novel on in an entertaining way. The POV of the story switches to Ivy, and Ivy is a very enjoyable main character. The continuing story told from her eyes makes things even tastier! The setting description is as delightful as ever, and Scotland is always a good choice of scenery! I enjoyed the setting and gobbled up the Scottish highlands. The main cast remains the same, more or less, with a fe A precious story I couldn't put down! The main cast remains the same, more or less, with a few additional characters--and they really kept the story moving. I adore Ivy, so seeing her as the main character was amazing. Most of the characters were ones you could root for and everyone's motivations and personal development were excellently portrayed. I also enjoy the younger characters. They're portrayed very well and never fall flat or shallow, nor do the adult casts, but it can be easy to 'dumb' younger characters down. There are no such concerns with this series! The Biblical themes in this book were moving and realistically portrayed--once again, hard topics are addressed, but Jesus' Hope is shown in a respectable manner. The character arcs are not rushed but the spiritual aspects are solid. Whether you are a Christian or not, this book will not shove the Gospel down your throat, but rather weave it brilliantly into a tale! As the previous book and the blurb foretell, the topics tackled in this book involve an absent father returning to his wife (view spoiler)[ after his second wife falls ill and dies (hide spoiler)] and children. The main character, Ivy, goes to a boarding school for children who need special teaching, and there is a character at the school who will have 'devilish' fits/tantrums. Pregnancy is explained in brief detail (nothing extreme at all!). There are mentions of drinking beer. There is a brief scene where kissing/caressing take place, but there is little detail and it is frowned upon. This novel, all in all, is clean and has no cussing or explicit content. I would give it to readers 12+. I love Ivy's POV, the Scottish setting, and amazing themes! 12-year old Ivy struggles to get along as easily as her twin sister Alice at Pearlbelle Park their new home. When her parents hear of a boarding school, McCale House, they decide to send her there, where a doctor can work out the best way to draw Ivy out of her own mind. #1 - I didn't realize how fun it would be to return and see how the adults around Alice and Ivy were doing. There were suddenly random romances developing around them and it was all quite fun and a great filler around Ivy and Posy's stories! And Posy was a lovely little girl I didn't expect and quite precocious, lol. I loved the part she played in her dad's story line. #3 - The religion was NOT NEARLY as intrusive... There was still the suddenness to becoming Christian but each answer to the different plot lines had to do with God and it came at the end with comments on kindness and stories that worked with what was happening in the plot quite well coming up to it but not so overt. The same strengths that applied in the first book were still in force in the second! The author has quite a consistent narrative voice and is great at historical fiction with a mix of modern sentiment. These books could quite get a little girl hooked on historical fiction!! BOTTOM LINE: Perfect Christian Lit Historical middle grade novel SEQUEL! Thanks to Kellyn Roth for providing me with a copy in exchange for an honest review. It has not influenced my opinions. “Trapped in a world where she doesn't belong, twelve-year-old Ivy struggles to keep her head above water as her simplicity is brought to light by her new position as a young lady growing up at Pearlbelle Park. Series: Book #2 in “The Chronicles of Alice and Ivy”. Review of Book #1 Here! *Note: Mentions of ghosts; Mentions of someone acting like a demon/devil (and because hearing that so often, a young girl believes that she is); A couple mentions of demons; A mention of Hell. Negative Content- Minor cussing including: a ‘bloody’, five forms of ‘stupid’, and eight forms of ‘idiot’; Some sarcasm; Mentions of doing something suicidal; Mentions of a young girl threatening to kill herself, being violent & hateful; Mentions of gallows & killing; Mentions of an accident & death (and seeing the person die, barely-above-not-detailed); Mentions of illnesses, screams, passing out, & deaths; Mentions of wars & fighting; Mentions of thieves & stealing; Mentions of alcohol, drinking, drunks, & taverns; Mentions of hunts, hunting, & shooting/killing animals; Mentions of nightmares; Mentions of gossip & rumors; A few mentions of lies & lying; A few mentions of jealousy; A couple mentions of an execution; A couple mentions of bullets & almost being shot; A mention of chamber pots. *Note: Mentions of women who have died in labor; A few mentions of the stork bringing babies; A couple mentions of miscarriages; A mention of a baby wanting her mother’s breast; A mention of a man seeing his fill of a woman’s figure. I liked meeting Alice in the first book of this series, but I have to say, I think I liked meeting Ivy a bit better in this second book. I didn’t care much for the adults in this story. They all bickered quite a bit and my head started to hurt because of their auguring. First off, bravo!!!! Encore!!! Amazing job, Kellyn! These books have to be among my favorite historical novels I've read. I enjoyed this one a bit more than I did The Dressmaker's Secret, but they both reminded me somewhat of A Little Princess. Maybe it's the setting, or the time period, or the sweet little girls (or all three), but I LOVED it. A Little Princess has always been a favorite for me, and the relation of the books to it but also how they were different made it a splendid read. The pl First off, bravo!!!! Encore!!! Amazing job, Kellyn! These books have to be among my favorite historical novels I've read. I enjoyed this one a bit more than I did The Dressmaker's Secret, but they both reminded me somewhat of A Little Princess. Maybe it's the setting, or the time period, or the sweet little girls (or all three), but I LOVED it. A Little Princess has always been a favorite for me, and the relation of the books to it but also how they were different made it a splendid read. The plot lines were easy to follow, and I caught many of the small lessons that made both books whole. There were many plot twists that caught me off guard, which I always love in a book. First of all, can I just say that Kellyn did a great job of writing Ivy and Violet? Violet is just wonderful (well, not in that way) she's fully developed, has issues, but isn't always just an angry person. Ivy.... oh Ivy is amazing. I love that she doesn't always know what's going on even when the reader does. I love that she (view spoiler)[ helps Violet simply by being her. (hide spoiler)] I love First of all, can I just say that Kellyn did a great job of writing Ivy and Violet? Violet is just wonderful (well, not in that way) she's fully developed, has issues, but isn't always just an angry person. Also, the subplot with Mr. Parker was stunning... I was sort of wondering what would happen to him (as he wanted to marry Miss Chattoway- now Mrs. King) I forgot he had a daughter (Posy) but I'm glad he did. I think I like this book more than The Dressmaker's Secret, but I love that one too. Wow, this book was good. Probably my favorite of the whole series. Ivy Introspective is about Ivy, who has high-functioning autism. I wasn’t really sure how this would play out at first, but my doubts died away pretty quick, because Kellyn wrote about Ivy’s condition with a really soft hand that wasn’t condescending at all + with a familiarity of that subject, which I was very appreciative of. Also, in the story Ivy gets sent to a boarding school named McCale House (not a spoiler- it’s in t Wow, this book was good. Probably my favorite of the whole series. - Mr. and Mrs. Knight: I mentioned in my review of The Dressmaker’s Secret that I didn’t really like them. Yeah, my views of them haven’t really changed. - Mrs. Angel: I’m not sure if I like Mrs. Angel? She seems nice, but Violet’s views of her seem to fluctuate a lot. - Jordy: I WANT TO SEE MORE OF HIM IN FUTURE BOOKS. - Posy and Captain Parker: I’m kind of confused as to why they’re in the story? I feel like the book would’ve gone well without them in it? Or maybe I just missed something. - Ivy: Ivy never ceases to amuse me. 😀 I love her personality, and I hope to see A LOT more of her in future books. Wow, the way Kellyn developes characters and scenes so you know them at a glance. Her characters’ personalities are so distinctive and that’s one of my favorite things ever to read in a book. It was such a blessing to have the opportunity to read this book, and her characters’ developments and personalities hold a big factor in that. Overall, lovely and well-rounded characters. All of these things I’ve mentioned are barely described. - mentions of ghosts. However, this idea is discarded as “nonsense” in the book. One of the most precious and perfect books I’ve read this year. I’m so grateful I got a chance to read this; thank you, Kellyn. 5 stars without a doubt. This book was so sweet and gave me all sorts of good feels by the end (especially about Jordy...let's all just fangirl over him, shall we?). I loved Ivy--so sweet and just trying to figure out things. (view spoiler)[And I loved that she fell in love with music and the piano! I play the piano myself & love music, so that was so fun. (hide spoiler)] And then Violet was so harsh and yet broken and she just needs a hug. And then Jordy was so awesome, and I want to actually meet him 'cause he'd b This book was so sweet and gave me all sorts of good feels by the end (especially about Jordy...let's all just fangirl over him, shall we?). I loved Ivy--so sweet and just trying to figure out things. (view spoiler)[And I loved that she fell in love with music and the piano! I play the piano myself & love music, so that was so fun. (hide spoiler)] And then Violet was so harsh and yet broken and she just needs a hug. And then Jordy was so awesome, and I want to actually meet him 'cause he'd be so fun to spend time with! The one thing that bothered me was (especially at first) the storyline with Posy and Mr. Parker. It was cute and sweet, and yet it never really related to Ivy, who is supposed to be the main character of the book. Once I got closer to the end of the book and sort of accepted that their storylines didn't really ever meet, I did enjoy reading about Posy, who was so fun and determined. Although I couldn't help but like the parts with Ivy better. I *love* this book! It's kind of something I've never seen before because neurologically atypical MC in HISTORICAL CHRISTIAN FICTION doesn't happen so often? But this was INCREDIBLY well done and just ADORABLE and I can't even. Pls first go read my review of book one because I said all the important stuff about plot and writing there. Here I am just saying a couple of things about the characters. In book two, there is Ivy's pov, and again, I was slightly skeptical, wondering how that would come out. Ivy is, after all, a bit more simple minded than others. WELL I NEED NOT HAVE WORRIED. IT WAS TERRIFIC. No less interesting than Alice's. Another thing about book two. We have the perspective and story of Mr. Parker, who is a Pls first go read my review of book one because I said all the important stuff about plot and writing there. Here I am just saying a couple of things about the characters. - The characters are smol beans who need protecting. Let me hug Ivy forever and also I love Violet and she needs more hugs than even Ivy and Posy was beautiful too and the characters give me many feels. - Although I honestly didn't like the adult characters all that much?? They infuriated me slightly. Honestly they felt immature and like they were harming the smol beans more than helping them. - Like I spent about 70% of the book just yelling at all the adults for being insensitive and not understanding and ahhhh. - I especially don't care about Christiana. She felt immature and selfish and does she not see that Ivy needs protecting?? - Though seriously, everyone misunderstands all the smol beaaannnnnss. *cries* Even the author. KELL I AM STEALING YOUR CHARACTERS AND PROTECTING THEM FOREVER. - The plot didn't really seem ... I don't know. It just didn't seem. *snods* See, the thing is this book is about .... Ivy. Or it very well should be. I mean it's called Ivy Introspective so ... :P But in the actual book ... maybe just a bit more than half of it is about Ivy? Like quite a bit is devoted to Posy and Miss Selle and Mr. Parker, plus Christina (*glares*) and just ... other characters. They are all connected to Ivy and it definitely isn't as bad as other books that I've read but just saying ... If you're looking for one central plot ... it's not as much? This definitely is a style, though which does come up in other, especially older middle-gradeish children sort of type books. It just bugged me a wee bit. - Aright, on the characters again (cause I'm mildly obsessed), I thought Mr. Parker was a jerk, but I really liked his sass. Honestly, it was beautiful. I liked Posy much better though. Yes, this is all. I'm honestly sorry that these reviews are mostly me fangirling and ... I'm not even sure what this is. - I also am seriously in love with Kirk and Alice. #KaliceForever, folks. - Vi is my precious. - Posy is excellent too. And I'll deal with the plot not focusing on Ivy just for her. She is excellent. - My heart ... Miss Selle is ... aaggghhh. - I love the McCales. They are excellent and just cool together. - And Jordy. Jordy is beautiful. - Basically I just really liked a lot of these charries, man. I'd yell about them all day if I could. - This is basically fangirling. I am sorry. - The Christianity in this one was so sweet! Like guys, Ivy is precious. And everything she does is precious. And oh my word I needa hug Vi. - Except ... Parker. Because we all know Parker is a jerk, even if his sass is excellent. I felt his Christianity was ... actually, yeah, this was sweet too, but felt a bit more rushed. It was sweet though, and I was cheering but yep. Em ... that's about it honestly? This was a lovely sequel and I liked all the characters (except the ones I didn't like). Honestly, I'm fairly certain I'll likely never have quite coherent thoughts on this? I'm too emotionally invested at this point. Review originally posted on Penumbra Reviews. Violet - *coughs* She has some difficulties, but I still liked her! Mr. Chattoway - he will be my favourite for a lifetime! He's so funny!!! Samuel - ah, he's a nice fellow! <3 That's all. Mr. and Mrs. Knight - I must say I like Mr. Knight more than his wife...I guess I feel Mrs. Knight is still too controlling! But, oh well, I can't like everyone! Very lovely!! ;) Same as my last review! I really, really liked it (obviously)! I loved this! Ivy is such a sweet and interesting main character. I loved her and Violet’s friendship and the way Ivy grew while she was at the McCale House. Her perspective was well done. The only thing I didn’t love is how a certain ship turned out in the end. It seemed a little rushed and unauthentic. But overall this was a great read and I’m looking forward to the next one! Kelly Roth hit it out of the park again with book 2 in the Alice and Ivy chronicles. Wonderful to see the inside workings of Ivy's mind. I beta-read Ivy Introspective and then reread it. That means I'm pretty familiar with it, so maybe my review is a little biased. The characters, most of whom are from The Dressmaker's Secret, are well-developed, and most were necessary(I'll get to the exceptions in a bit). Mr. Parker's struggle was good, because it portrayed such a personality well(I would have a difficult time with that). His actions were laughable, which added humor. Ivy was very sweet, innocent, and amazing. Her 'preaching' I beta-read Ivy Introspective and then reread it. That means I'm pretty familiar with it, so maybe my review is a little biased. The characters, most of whom are from The Dressmaker's Secret, are well-developed, and most were necessary(I'll get to the exceptions in a bit). Mr. Parker's struggle was good, because it portrayed such a personality well(I would have a difficult time with that). His actions were laughable, which added humor. Ivy was very sweet, innocent, and amazing. Her 'preaching' was great, because it was coming from her. After all, you must have the faith of a little child. My favorite new character had to have been Jordy, because who doesn't love accents like he has? He wouldn't have been as good as he was if Ivy wasn't who she was, but Ivy was, so it doesn't matter! Continuing from that minor problem (which doesn't detract from the whole plot, really), is Christina's love problems. Not that she can't have them, but do they need to be resolved in this book? If I'm not mistaken, this won't be the last of The Chronicles of Alice and Ivy. The other minor problem I had with this was that I always approve of helping a child learn at home. I'm glad it worked out for Ivy, but I don't think it works all the time. For example, if Violet hadn't met Ivy, I believe she would have been much better off at home. I don't think much of Violet's parents. Ok, so I read this book a while ago and wrote a review and apparently it never got posted. Ugh. So here we go. Surprisingly, I actually liked Ivy Introspective a lot better than its predecessor. Though it started out with a sour taste in my mouth due to the fact that I disliked one of the main foundations of the story— how Claire and Philip ended up together—I was surprised to find as I continued to read how much I liked it. I enjoyed seeing Ivy’s life and watching through her eyes and thought th Ok, so I read this book a while ago and wrote a review and apparently it never got posted. Ugh. So here we go. Surprisingly, I actually liked Ivy Introspective a lot better than its predecessor. Though it started out with a sour taste in my mouth due to the fact that I disliked one of the main foundations of the story— how Claire and Philip ended up together—I was surprised to find as I continued to read how much I liked it. I enjoyed seeing Ivy’s life and watching through her eyes and thought the author did a fantastic job, I almost even liked it better than Alice’s life. While the first book spiraled a bit more, IvIn felt more focused and centered, concise and sweet, every scene leading into the next. I thought the author did a fantastic job with Ivy and her disability and her relation with those around her, too. As well, I thought for the first 3/4 of the book the “Christanese” was great. It slipped in here and there, embellishing on or making a subtle point. I actually was getting impressed…until the last quarter of the book hit, where it felt like every other character had an overnight transformation and while one moment they were devoutly convinced to never trust God the very next they’ve repented and decided to completely give their life to Him, and the next moment everyone else has completely accepted this without question or thought. I just found it a little rough and cheesy. I love the heart behind it, but it just became very cringeworthy very fast. I love the author’s heart, but I think it needed to be toned down. Just like you can’t force the gospel down a friend’s throat, you can’t force it down a reader’s throat either. Otherwise, I really enjoyed the book and look forward to seeing if there’ll be a next one? ;) 4.0 stars.